Our DTS snag-less competition belt is a three peice belt with a inner velcro belt, an outer 3M velcro belt, and a belt keeper/loop/safety. Specifically made to hold IPSC, USPSA, 2-Gun, 3-Gun and Multi-gun gear through intense compeition, the DTS belt is stiffer than our comepritiors belts, and will hold your holster, rifle and pistol magazine pouches, and shotshell holders. Our outer belt features innovative 3M snag-less velcro to prevent snags on performace shooting shirts, jerseys and accessories. The width of the belt is approximately 1.5" and we shaved off 1/16" to ensure our belts universally fit most belts attachment, including Double Alpha Academy, Ghost International, Blade-Tech, Black Scorpion, CR Speed & More. We have shortened the included belt keeper/loop/safety to ensure it doesn't hang awkwardly after securing your belt, and get in the way. The keeper features our logo on a rubberized back, so you don't have to worry about snagging embrodidery. Our belts have been used in shooting competitions all over the world! In Canada, they have made an appearance at every provincial/territorial IPSC championship, IPSC Canadian Nationals, and at several IPSC World Shoots. PLEASE NOTE: Belt Fabric may not be exactly as pictured, we are in the process of changing the fabric weave. 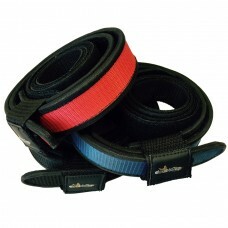 This is currently only true of most of our BLACK belts for all sizes, and RED & BLUE in our most poular sizes. Photos are included with this product discription. If you would like to know which style belt is avaliable in your perferred size and colour, please contact us or leave us a comment with your order, and we will get back to you. By designing our own belts, we are able to provide customers with a high quality competition shooting belt, for an affordable price. After years of buying and trying different competition belts on the market, we were fed up and set out to make our own. The available belts were either too expensive and lacking in features, or cheap one-time wear imitation belts that would fall apart. After making a wish list of all the things we hoped to see in a belt, and listening to customer concerns about the belts in the markets, we put together a design we hope would fill a void missing in competition shooting gear. SIZING NOTE: For proper sizing, take your actual pant size and increase by 1 to 2 sizes EX. 36 Pant= 38 or 40 Belt***We recommended a 4"-6" overlap. If you are between sizes, it is best to choose the larger size. Please contact us if you have any questions or concerns, we will do our best to ensure you recieve the proper size. See chart below.